MingmaNuru Excursions Pvt. Ltd.About Us - MingmaNuru Excursions Pvt. Ltd.
Mingma Nuru Excursions you just walk rest we do…we provide all services for trekking and mountaineering. We try to give you best holiday an unforgettable adventure and experience. In addition, we organize trekking and mountaineering, mountain flights into the mountains, elephant safaris, and many other activities for a thrilling and exciting adventure holiday in Nepal, Tibet we organize and departure trekking and expedition as you request…..we also provide you porter guide service in Nepal. Mingmanuru Excursions has been registered at Ministry of Industry Division, Ministry of Culture, Tourism & Civil Aviation [Registration No. 884/064], Ministry of Industry Commerce & Supplies [Registration No. 51169/064/065], Domestic & Small Industry Department under Ministry of Industry [Registration no. 10553/403], Department of Taxation under Ministry of Finance [Pan No. 302836077], Central Bank of Nepal for foreign currency transaction[846/1/064]. Mingmanuru Excursions is also an active member of Nepal Mountaineering Association[NMA] and Trekking Agents Associations of Nepal(TAAN). Mingma Nuru Sherpa was born in the remote village of Pawai V.D.C.ward no. 1, Solukhumbu district, Nepal. He started his trekking career in his early teenage and since then he has been continuously striving in this field of trekking and mountaineering. He has dealt with tourists from different countries. He has also worked with many expedition teams to Mt.Everest and other mountain peaks of Nepal. 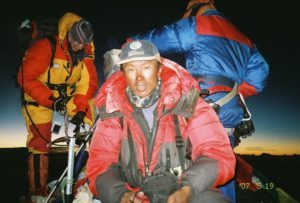 Mingmanuru also summitted Mt Everest many trekking 6000m peaks in also Europe Germany (Zugpitze alppitze) and Austria(Hochkonig, Grossglogner, Bischofsmutze) He has scaled almost all peaks of Nepal successfully. Utilizing his many years of experience in trekking, he has now established an agency (Mingmanuru Excursions) that promises to serve the travelers in the best possible way. Mrs: Mingmanuru has a keen interest in traveling and has been actively involved in the tourism field. He has been dealing with the foreigners as well as locals as a Public Relation Officer since the establishment of this office. We try to give you quality service. We have experience Sherpas, cooks, Our Sherpas have a good education about the environmental protection in the mountains, first aid, altitude sickness, emergency evacuation, etc. so that you remain healthy and active during your trip. All our cooks are experienced for the preparation of dishes.We use local and domestic and imported products. Special dishes including vegetarian should be mentioned on our booking form. We always endeavor to fulfill your requirements but in more in remote areas, however, this may sometimes not be possible. We provide personal equipment of high quality, including dining tent, toilet tent, also cook kitchen, foam mattresses, folding chairs, and tables equipment. Transportation: Airport transfers, sightseeing tours in Kathmandu and outside of Nepal are carried out with the deluxe or luxury buses or cars with our guide or companion. For the treks in remote areas, transport facilities will be adapted to the road conditions. We work with hotels of various categories, along with international standards to star budget hotels and lodges and hotels that we book will provide we also provide helicopter sightseeing as you request.